To do this, simply call the URL of the app builder. Like it is shown in the window, you can log in with your login data under Login. If you do not yet have your own login data, register under the register tab. You will then receive a confirmation e-mail with your access data. 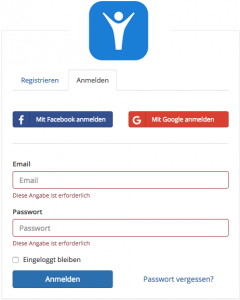 Alternatively, you can sign in with your Facebook or Google account.